Today in History: March 11, 1425 B.C.E. 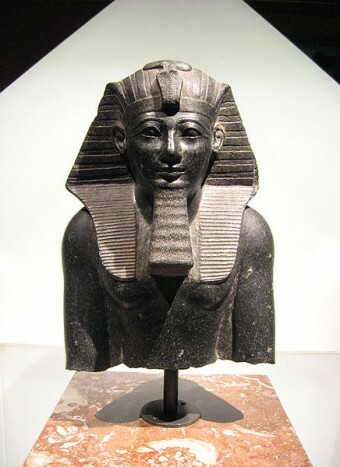 Thutmose III is considered one of the greatest pharaohs of ancient Egypt. He excelled both a general and as a statesman, and during his reign Egypt reached the height of its power and prestige. When his father Thutmose II died, the boy who would become Thutmose III was only ten years old. His stepmother/aunt, Hatshepsut, was acting as regent until he was old enough to rule, but ambition got the better of her, and she usurped the throne for herself. This may have been a blessing in disguise for young Thut; it gave him a chance to hone the military skills that would come in so handy down the line. After 20 long years of waiting, Hatshepsut kicked the bucket and Thutmose finally claimed his birthright as pharaoh. He got to work right away. His grandfather,Thutmose I, had extended Egypt’s reach far into northern Syria. His son had pretty much rested on his dad’s laurels, and by the time Thut the 3rd came to power, the Syrians decided that their days of paying tribute to Egypt were over. A coalition was being formed by the king of Kadesh in northern Syria against Egypt, which was most likely aided by Mitanni, a Mesopotamian kingdom busy expanding its western borders, and that had everything to gain by Egypt being held in check. For 18 years, Thutmose increased Egypt’s territory and wealth immensely. Instead of killing his enemies, native rulers were allowed to govern their own lands – as sworn vassals of Egypt bound to obey the pharaoh’s representative in the area. Their children were brought to Egypt and educated at court. When they returned to their birthplace, they were thoroughly indoctrinated to Egyptian life, solidifying Egyptian influence and rule. When Thutmose III died on this day in history, 1450 BCE, he had the distinction of conquering more land for Egypt than any other pharaoh. He was entombed in the Valley of the Kings, in a remote spot halfway up a rugged cliff. When their work was done on the tomb, the masons concealed its entrance and destroyed the staircase leading to it. Nevertheless, as was so often the case, grave robbers looted the pharaoh’s final resting place. When Thutmose’s tomb was uncovered in 1898, all that was left was a sarcophagus, a few wooden statues and some broken furniture. The king’s mummy, along with many others, had been moved to a secret hiding place by ancient priests for safe keeping, which was uncovered by archaeologists in 1889. I set thy glory and the fear of thee in all lands, and the terror of thee as far as the four supports of the sky. . . . the rulers of all foreign countries are gathered together within thy grasp. I stretch out my hands to bind them for thee.